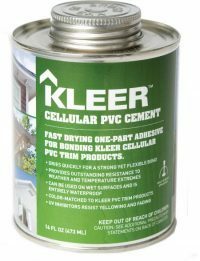 Kleer offers a comprehensive selection of fasteners and adhesives engineered for PVC products to help speed up your installation and ensure long-lasting results. Like most trim products, Kleer Lumber may expand and contract during hot and cold temperature changes. Using Kleer Fasteners and Adhesives for PVC will help minimize this movement. Before installation, allow Kleer Products to acclimate to room temperature. Whenever possible, install Kleer Products over a continuous substrate to help keep your trim straight and secure. Check out the following install tips or download the complete Kleer Lumber Installation Instructions. Contact a Kleer Lumber Service Representative to learn the right way to tackle your installation challenges.